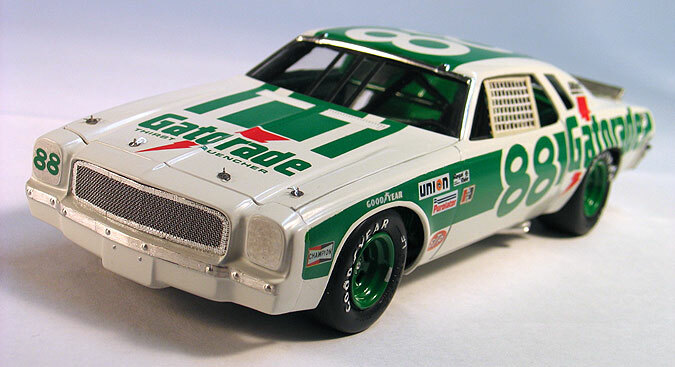 The old 1974 AMT Chevy Chevelle Laguna stock car model kit was recently re-issued by Model King, but I actually built this car the first time it was re-issued back in the mid '90's. 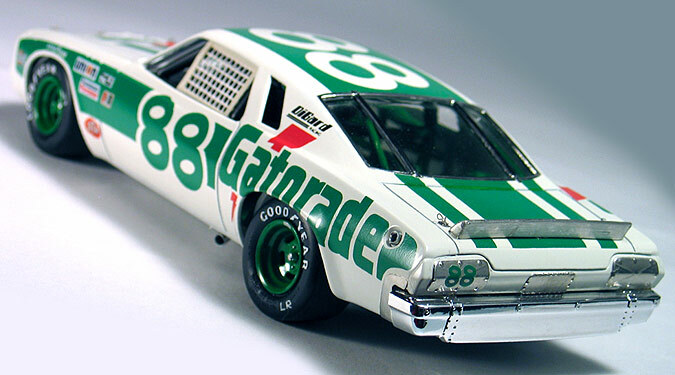 I built mine as a replica of the one of the #88 Gatorade sponsored race cars Darrell Waltrip drove. Its built mostly from the box but I did add a few extra details. One of the changes I made was to the wheels. I thought the wheels that come with the kit looked a little too deep. I happened to have an old AMT Dodge short track car kit which had a set of wheels that looked better to me so I used those as a master and cast a duplicate set out of resin. The decals were taken from the Fred Cady Gatorade sheet made to fit a Buick Regal. I cut and reshaped them to fit the Chevy Laguna body. These decals were the only option for me back when this model was built, but currently a more accurate decal sheet designed to fit the Model King Laguna stock car is available from Powerslide. I also wanted to make the grill look a little more realistic, so I replaced it with fine scale real wire mesh. Other details I added were side exhaust dumps made from aluminum tube, photo-etch hood pins. and a driver's side window net. I've got several of these Chevys stashed away so hopefully some day I will get around to building another. 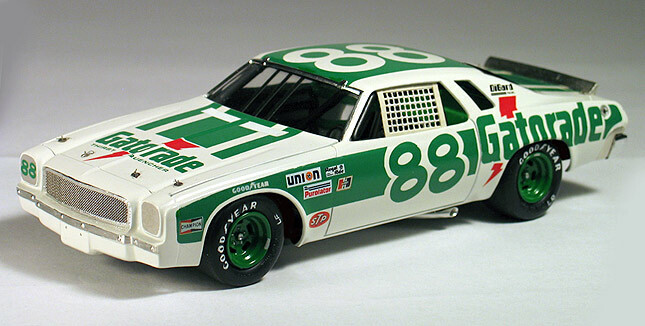 Below is a photo of the actual #88 Gatorade Chevy Malibu Darrell Waltrip drove.